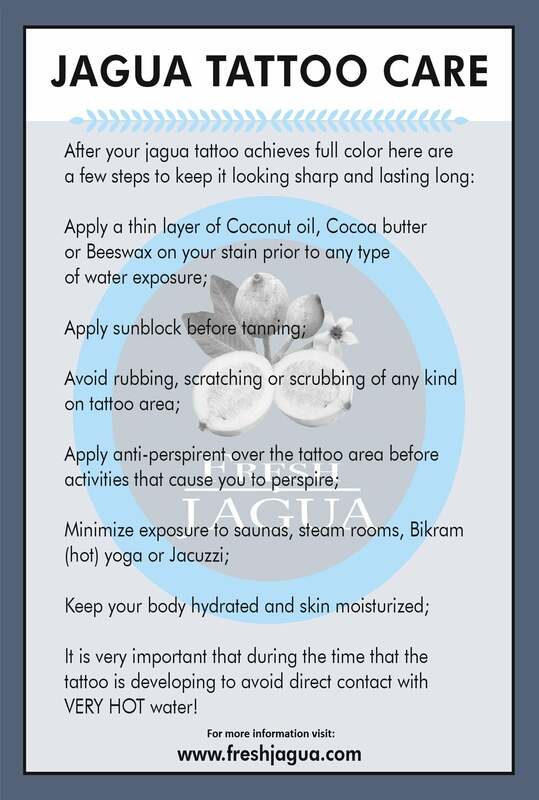 Jagua is a completely natural product, but caution should still be used in its application. Even natural products can be a source of allergic irritation. To avoid any possible allergic reactions, please read and follow the guidelines listed below. Jagua should be applied in a manner consistent to the instructions on this site. Any person taking medications, consuming large quantities of alcohol, or having known allergies should consult their doctor prior to using Jagua. Before using Jagua, test for allergic sensitivity. Place a few small dots of the gel behind the ear and let sit for two hours before peeling away the dried product and rinsing. Wait at least two additional hours and if no reaction has occurred, it is safe to assume that no adverse reaction to the product will occur. Do not ingest. Although Genipa Americana (jagua) is eaten throughout much of South America, our product was not created as a food product. Keep out of eyes. If Jagua comes into contact with eyes, flush with plenty of water and consult a health care professional.